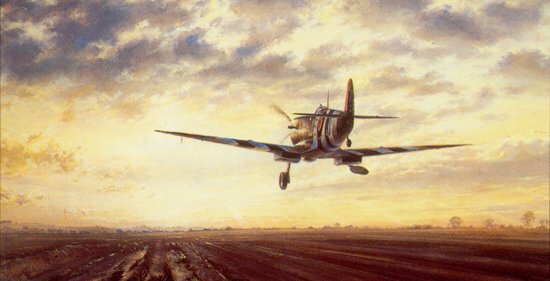 Marked with black & white stripes to facilitate D-Day recognition of friendly aircraft, an RAF Spitfire Mk.IX takes off to form up for invasion day support missions. The Spitfire was produced in many models and served air combat, ground support and reconnaissance roles. Personally autographed by Air Vice Marshall J.E. "Johnnie" Johnson, an RAF ace with 38 victories, and Alex Henshaw, British air racing pilot and Spitfire test pilot.